Retail Manager POS Software offers a comprehensive Lay-By module that will enable you to confidently process and manage your Lay-By customers. Lay-By deposit %, Cancellation %, Lay-By Term (In Days), Printed Terms and Conditions and Storage Locations can all be preset. When processing Lay-By transactions, customer name, address, contact details and purchase item(s) are entered. The required deposit is automatically calculated. 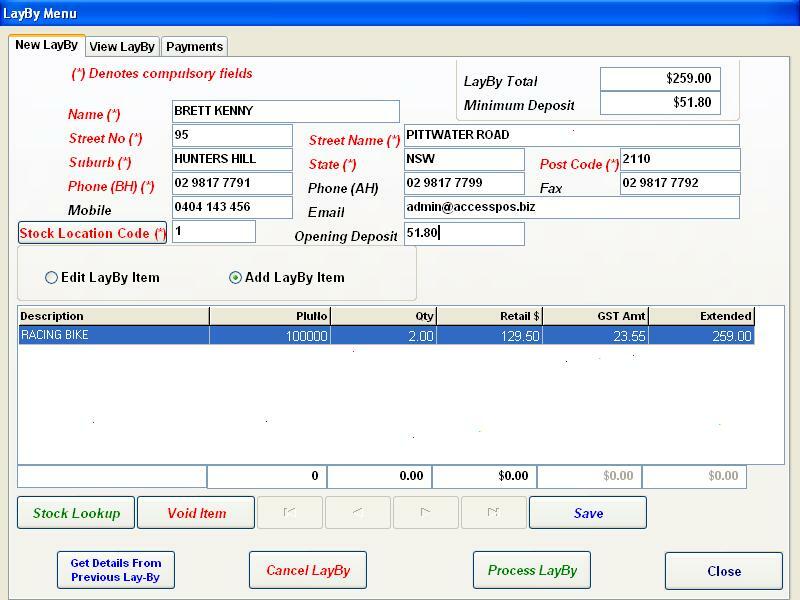 A customer receipt is printed detailing Lay-By item(s), deposit paid, balance outstanding, Lay-By terms and conditions and a unique barcode to enable easy customer tracking and recall on subsequent visits. A shop copy receipt is also printed that can be attached to stored Lay-By item(s). A complete purchase and payment history is also recorded for each customer. Customer receipts can either be printed on 80mm thermal POS paper rolls or A4 size paper. 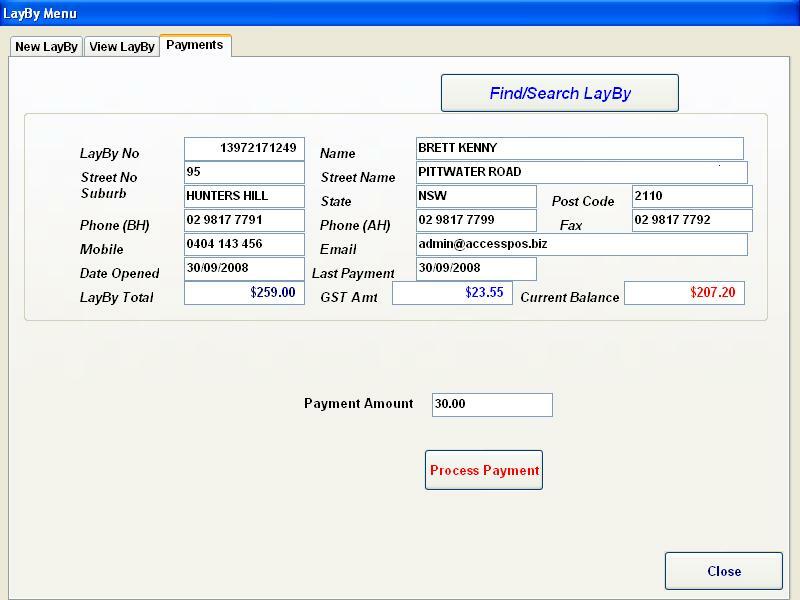 You can purchase the Lay-By Software as either stand-alone or fully integrated into Retail Manager POS Software. If purchasing the Lay-By Software as stand-alone, it is licensed by the number of computers in which it is to be installed. Hence, when ordering, the quantity needs to represent the total number of computers in which it is to be installed. ie. POS Computers / Terminals & Back Office (Administration) Computers. 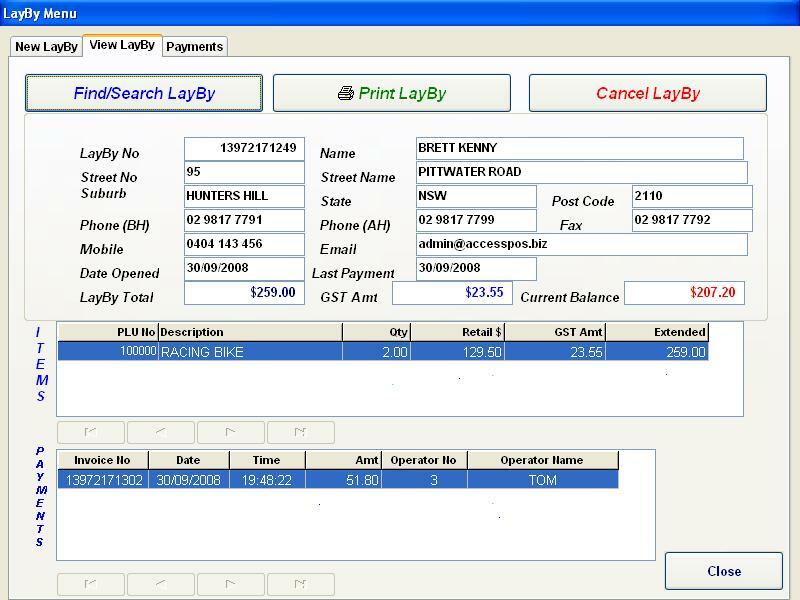 If purchasing the Lay-By Software as an integration to the Retail Manager POS Software then you need to purchase the same number of Lay-By Software licenses as the number of computers you are licensed for the Retail Manager POS Software. ie. if you are licensed for four (4) computers then you would need to purchase four (4) Lay-By Software licenses.